Ross started his career as a management trainee in the property and casualty business but after three summers and 6 permanent months decided to opt for the world of life reinsurance. His employment history is comprised of large international companies and Canadian entities that needed his management, reinsurance, technology, marketing or risk selection skills. Over the many years he has given advice or informative speeches and lectures in 42 countries to a diverse audience whose composition has been from producers to reinsurers, presidents to junior staff. With 40 years of insurance industry experience, Ross has evolved into a recognized mentor, advisor and reassurer. From 1994 to 2009 Ross has been used on various assignments around the world by RGA. His own company, since 2000, has acted as a confidential advisor to companies and organizations. He has provided advice or opinion to the Government of Canada regarding acquisitions, European, Canadian and Asia Pacific based executives on insurance operations, risk management reviews, and numerous expert opinions on claims and reinsurance matters to companies and lawyers. In 2007 Ross joined three other senior insurance experts and formed LOGiQ3 Underwriting Solutions Inc. to provide the industry with much needed assistance in the areas of administration, risk management, underwriting and advisor training and other ancillary underwriting outsourcing solutions and direction. In 2005 Ross was awarded the prestigious LOMA Education Award for his decades of contributions to insurance education around the globe. The second major event of 2005 was the publication of Ross’ first of three books. 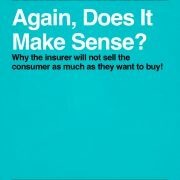 This first book is titled “Again, Does It Make Sense?” and is a reflection on why your insurance company will not issue all the insurance you may to buy. Ross, in addition to the executive roles, has had major consulting roles with: one of the largest US companies for best practices, a very major Australian company, a fast growing and leading Hong Kong company, North American Life’s retrocession strategy in the world, Canada’s largest managing general agency, the RGA/IBM venture into technology (TAIMS) and with Sun Life’s initial office in China. Most recently Ross has lectured on risk management, especially risk selection, to the Central University of Finance and Economics in Beijing, the Shanghai University of Finance and Economics, and the University of Alabama’s Culverhouse College of Commerce and Business. 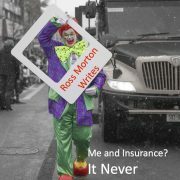 Ross Morton’s (www.rossmorton.com) confidential consulting service specializing in reassurance and advice on industry issues, be they claims, underwriting, management, marketing or reinsurance. Acting as an arbitrator or mediator where he brings his broad scope into play has been rewarding for both insurers and reinsurers. His Canadian and International experience working with companies experiencing either rapid growth or rapid adjustment to competition makes for sound strategic advice. Confidential mentoring to or reassuring of senior executives in today’s marketplace are an examples of Ross’ activities. 1977-1988 Executive Vice President & Chief Agent for Canada, Storebrand Reinsurance Company Ltd.
Ross worked each summer and major holiday break for different departments of the Royal learning the rudiments of such functional areas as claims, automobile underwriting, aviation risk selection, personal lines cover and insurance in general. AS an abstract mathematics graduate from University of Toronto he fit right in to the Royal upon graduation. As the fleet supervisor for Ontario, Ross acquired quickly the finer points of dealing with consumers, small business and agents. As the months passed the boredom and monotony of his role plus the slow pace of his “management training” directed him to seek more invigorating pastures. Ross joined the Mercantile and General Reinsurance Company as a life-underwriting trainee. He progressed through the various levels of underwriting, ultimately being responsible to the president for all underwriting matters. During this period of 1970 to 1977 Ross was very involved in industry education, receiving his Fellow Life Management Institute designation in 1972. He went on the chair LOMA’s curricular committee, editing textbooks, and became examination committee member and secretary of the Canadian Home Office Health Underwriters Association. In 1973 he gave his first lecture in Japan and several speaking tours through the Caribbean. It was this period that saw M&G grow to number one reinsurer in Canada and make major in roads into the US market. In 1977 Ross joined Storebrand Reinsurance Company, and advanced through the levels of responsibility to the level of Executive Vice President and Chief Agent for Canada. Storebrand grew to a significant reinsurer in the Canadian market ridding itself of its economic woes and terrible image. It was at this time Ross took the reinsurance subject and the complexity of large case underwriting and management to the agent and broker to broaden their knowledge base. Fortunately Storebrand was able to keep Ross’ interest with roles in nonlife reinsurance, systems and international expansion of the Norwegian company. As he worked for three owners, one Norwegian and two Danish, his conciliator/mediator skills were honed to perfection. Industry involvement again was very evident during these years, as it would be for future years in the industry. Ross has served as Chairman or President of the Canadian Underwriting Committee, the Life Insurance Institute of Canada, Canadian Reinsurance Conference, and has been on the boards of CLHIA and LOMA Institute Council. From 1988 to the end of 1989 Ross worked for the National Life as Vice President and General Manager of their systems, underwriting and issue department. The importance of product and distribution combined with customer service was accentuated as absolute necessities for success. It was here Ross applied first hand his skills in a direct company and garnered valuable experience in the nurturing of distribution forces both large and small. His tutelage under a marketing master and distribution guru was like a Ph.D. degree in insurance marketing. Although the experience was invaluable the environment long-term was not in harmony with Ross’ desire to expand his horizons. Needing a challenge and feeding a curiosity about insurance software design, construction and pricing he then as Senior Vice President of CAPSCO Software became deeply involved in systems design and championing user-friendly software for both agents and new business departments. This short-term assignment benefited both Capsco and Ross as the products went on to be purchased by most Canadian life insurers and some international insurers. In a period of expansion and rapid change at Manulife Ross played a key role in design and implementation of Manulife’s expansion into the Asia Pacific and European reinsurance and retrocession market. As well he lent his expertise to the prudent improvements in their risk selection process in the direct life operations. The life reinsurance operation for which he was responsible performed well above Manulife’s general level of performance in terms of return on capital, production and staff service to customers around the world. Ross gave many lectures throughout the region before audiences of agents, managing general agents, executives, underwriters and actuaries. This four years plus period was Ross’ indoctrination into the politics of large institutions and the conflict between team effort and personal gain. Labelled as one of the most politically driven companies at the time, the experience clearly left an impression of the functionality of large companies and their ability to manage jumbo issues. Ross was very instrumental in the growth of RGA in the Canadian market and his early role was one of adding structure to risk selection and opening the doors of the established companies. RGA forged relationships with all Canadian companies through Ross’ tenure and became a principle force in the market. Growth for RGA Re Canada surpassed expectations of owners in almost every year Ross was there in his role as Executive Vice President. Ross remained very close to RGA Canada and participated in issues where his experiences or opinions helps the company make prudent decisions and service a close and competitive market. This affiliation ended March 31st 2009 as Ross wanted to be free of the restrictions of being so closely tied to one company. RTP is still in existence and Ross has no current involvement with it he did serve as a director and other sundry roles over its history. Originally formed to work with IBM on the TAIMS project from 1994 to 1996 RTP has gone on to be an underwriting rules’ base for automated risk selection. TAIMS was a real learning experience and the only instance of a failed opportunity for Ross. The TAIMS opportunity garnered an overwhelming support from the industry (producer, distributor, insurer and reinsurer) and from the contribution of the dozens of people the industry issues and solutions were mapped to perfection. The demise of TAIMS no longer frustrates Ross but it remains a constant reminder to pick one’s partners with care. RTP has morphed into a technology performer in its own right. Ross played a significant role in the opening of and the image building of RGA offices throughout Asia Pacific. From minor roles with Japan and South Korea to more significant roles with China, Hong Kong, Malaysia, Australia and Taiwan Ross left footprints on all operations. The cherished relationships with the many that taught the Ontario farm boy about such different cultures and helped opened doors of opportunity remain highlights of his career. The roles were ever changing but involved risk selection auditing RGA itself and its larger customers, mentoring on the nuances of reinsurance, risk selection and sometimes management (for those who listen), speeches to RGA customers and risk management reviews of insurers. The list grew and consolidated depending on issues and developments in each country. This role with RGA ended at the end of 2008 after as happenchance would have it of Ross’ being in Mumbai when some trouble arose in November of 2008. Ross first lent himself to the advisory board of this new company which is a subsidiary of LOGIQ3 itself. The role started out as one of mentor to the new ownership after it converted itself from its RI3K lineage but has recently taken on a more active role as they move the company into the auditing, risk management review, underwriting consulting, outsourcing, and education space. Working with some bright young entrepreneurs in a new venture has its rewards. The education program offered by LOGiQ3 has now been employed very successfully in four major Canadian companies and graduated over 50 “underwriters”. Ross also sits on the advisory board of LOGiQ3 Inc. Itself which is minority owner of LOGiQ3 Underwriting Solutions. In November 2005 Ross published a book entitled “Again, Does It Make Sense?” which has sold out its first three printings. See www.rossmorton.com for more. Numerous articles and speeches have been and continue to be written for global audiences and internet readers. Most are available on his web site. [tab]Ross writes or has written articles for various publications including SOA Reinsurance Section Newsletter, the Canadian Journal of Life Insurance, marketingoptions.com (formerly in paper as Marketing Options), Journal of Insurance Medicine (ALIMDA), On the Risk, Cover (South African magazine), Minto Review. The numerous speeches Ross has given have been to audiences in 42 countries* on Communication, Management, Systems and Networks, Reinsurance and Underwriting. Ross has also provided commentary, anecdotes and management review to authors for their books on management as well as a couple of authors of insurance nonfiction!. Editing LOMA texts and writing a couple of chapters in LOMA texts sparked the writing candle that has become more than a flicker.